When I first encountered foreign-sounding words like domain, SSL certificates and hosting, I nearly abandoned the idea of creating a WordPress website. Luckily, the process wasn’t nearly as difficult as I feared. This is the tutorial I wish I had when I started. It is a complete beginner’s guide, for those with no prior web-design experience. 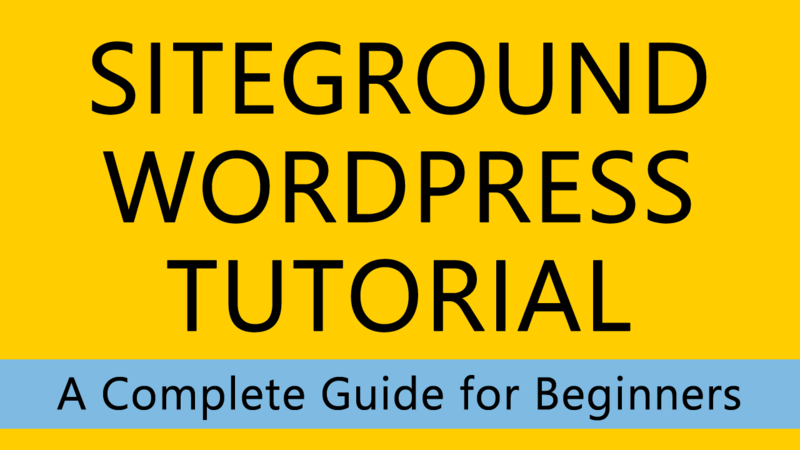 It contains step-by-step screenshots, accompanied by clear instructions, showing how to set up a new WordPress website at SiteGround. Completing this tutorial gives you a professional website within 20-60 minutes. COPYRIGHT NOTE: This tutorial is available as a printable PDF. The tutorial is owned and published by the Student Art Guide. It may be printed and copied, free of charge, for personal use or in a classroom situation. 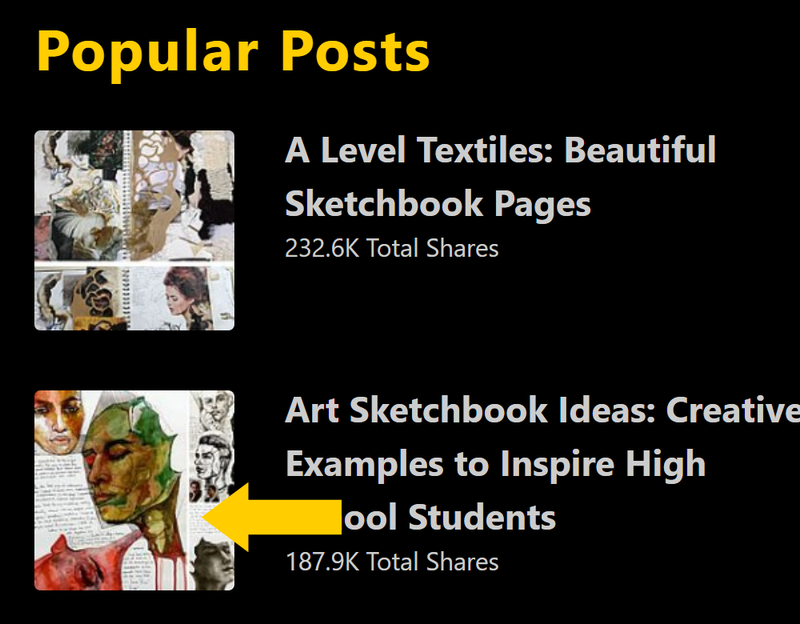 To share this material with others, please link to the original article: https://www.studentartguide.com/articles/siteground-wordpress-tutorial. Copying, uploading or distributing this article in any other way is not permitted. 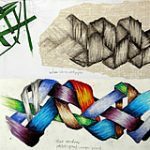 DISCLOSURE: The Student Art Guide provides content free of charge, so that all students and teachers can access our resources. We make money through advertising and affiliate links. In this tutorial we link to SiteGround, a hosting provider who we recommend completely: our reputation and success depends upon this. Purchasing hosting via these links allows us to continue to deliver quality resources to you, for free. For a full SiteGround hosting review, please visit: How to make an artist website. A website host provides space on a computer server for storing your website files so that your website is accessible on the internet 24/7. We recommend SiteGround. b) Choose a SiteGround hosting plan. The StartUp and GrowBig plans are suitable for beginners. The main difference between these is that the GrowBig plan allows you to host an unlimited number of websites, whereas the StartUp plan only allows one. 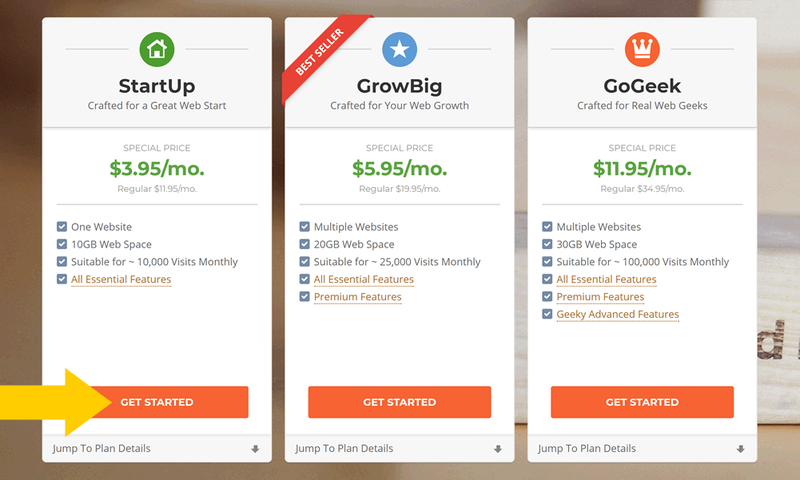 There are a few other differences, for example, the Growbig plan is slightly faster. For most beginners, the StartUp plan is fine. c) Click the ‘Get Started’ button. NOTE: If you get stuck at any point during this tutorial, SiteGround live chat is accessible from the top right corner of the SiteGround website (under ‘Help’). They have trained support staff on-hand to help beginners through this exact process. Once you have signed up, chat support is available via the ‘Support’ tab on the menu. 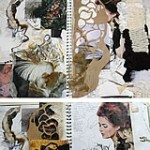 Please also feel free to email me, Amiria Gale, the author of this tutorial: amiria [at] studentartguide.com. I am a high school teacher from New Zealand. Questions help me to improve this tutorial and provide valuable feedback, letting me know when something has become outdated (technology changes very fast). A website name, such as www.studentartguide.com, is called a domain. a) Type in the website name that you would like. Others have already purchased many domain names, so your first choice may no longer be available. Most one-word domains are already gone. 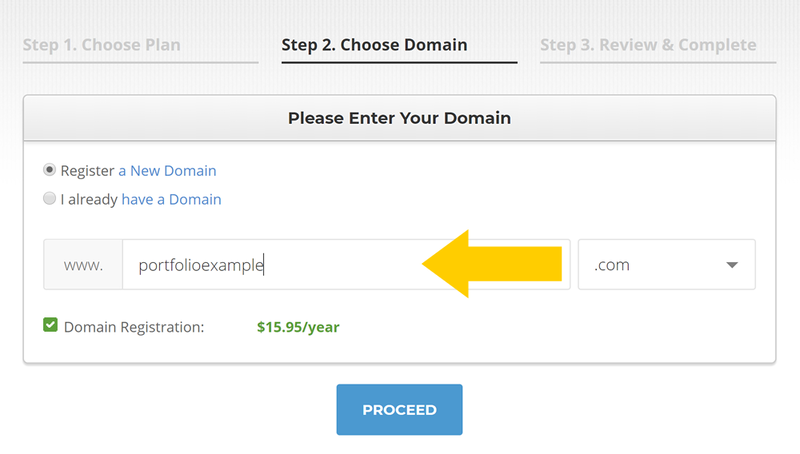 b) Choose the domain extension (the ending of your website name, such as .com). If you hope to reach a worldwide audience, .com is recommended, as it is most common and memorable. Alternatively, you may wish to use .org or .net (derived from ‘organization’ and ‘network’). If your audience is in a single country, a country-specific domain, such as .co.uk, may be suitable (country-specific domains are more expensive). 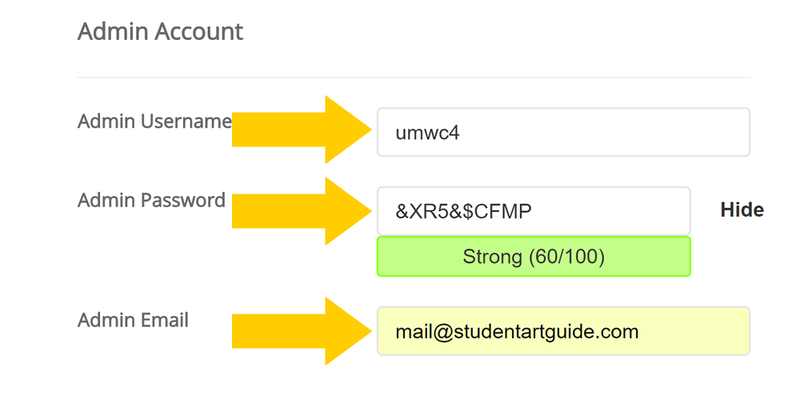 a) Enter your email and create a password (these are your login details for SiteGround – write these down). b) Enter your contact information and payment details. If you are under 18, please seek parental permission before entering credit card details. c) Choose the data center location that is closest to your audience. SiteGround is one of the few hosting companies to offer data center locations in more than one country (current locations are Chicago, Amsterdam, Singapore, and London). Selecting a SiteGround data center location that is closest to most of your audience may make your website load a fraction faster for these people. SiteGround hosting is fast, regardless of location, so this is not too crucial. If your audience is worldwide, or none of the locations are close to your audience, it doesn’t matter what you choose here. d) IMPORTANT: Select the hosting period. The discounted pricing is for the selected billing period only, paid in advance. Selecting one month, for example, means the discounted rate only applies only for that month, with the second month renewing at the regular price. The one-month plan also has a set-up fee, making this the most expensive option long-term. Selecting 12 months, on the other hand, avoids the set-up fee and applies the discounted rate for that full year. Selecting 36 months ensures that you have access to the discounted SiteGround pricing for the greatest length of time. SiteGround has a 30-day money back policy for their hosting plans, so you can get your money back for hosting if you change your mind. e) Leave ‘Domain Registration’ ticked. This is the website name that you chose earlier. f) Select ‘Domain Privacy’ (highly recommended). All website owners are required to have their contact details in a public database called WHOIS. This archaic rule was created when there were very few websites in the world and it was an effort to make a kind of telephone book with contact details listed. To get around this, website hosts offer ‘Domain Privacy’, which replaces your contact details with the host’s generic contact information, and keeps your private data safe. If you have signed up using a business address and contact phone number, this may not be necessary, however, for most people, it is highly recommended. g) Choose whether you would like the ‘SG Site Scanner’. This scans your website for malicious code and notifies you if you get hacked. Although hacking is rare, all websites are vulnerable to this. When creating a new website, I keep things as cost-efficient as possible. However, I do use this for some of my larger websites. The SG Site Scanner doesn’t STOP your website from getting hacked; it just lets you know straight away if it happens. h) Tick the SiteGround ‘Terms of Service’ box and click ‘Pay Now’. i) Click ‘Proceed to Customer Area’. To become the proud new owner of your website domain (the website name), you must verify your contact details. This confirms that you are not a spammer and have entered accurate contact details. a) Sign into SiteGround, using the email and password you created earlier. b) Click ‘My Accounts’ on the menu. Note that the domain status beside your new domain says, ‘pending verification’. 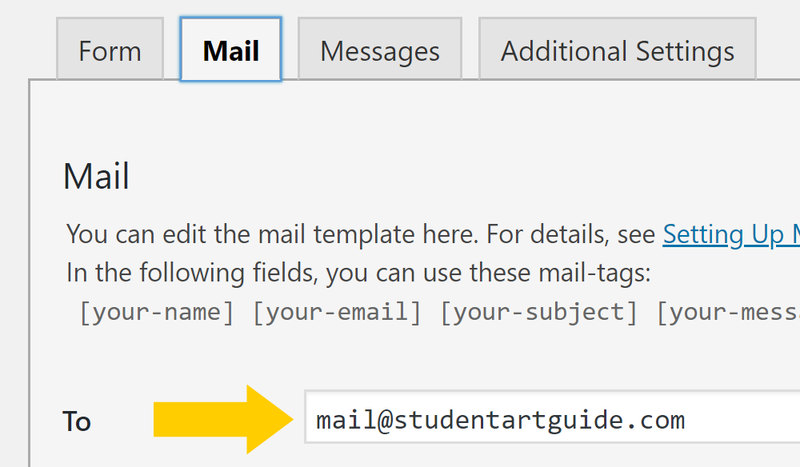 There is a ‘resend email’ option next to this if you are unable to locate the correct email in the next step. c) Open your inbox. 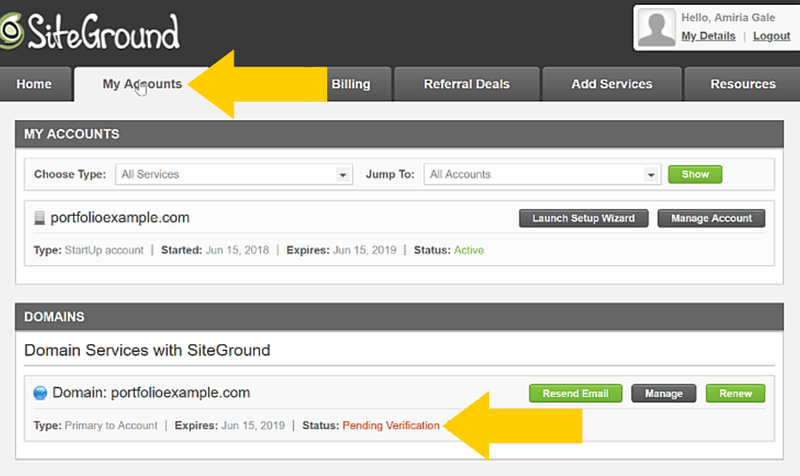 You will have received several emails from SiteGround, such as an invoice and welcome email. d) Locate an email with the subject line ‘Verification Required’. This email may get caught in spam filters, so check your junk mail if necessary. If you can’t find it, resend the email or seek assistance from SiteGround live chat. e) Click the link in the email. This takes you to a confirmation screen from TUCOW INC who supply SiteGround domains. f) Click ‘Verify Information’ to confirm that your contact details are correct. g) Locate a data privacy email (optional). 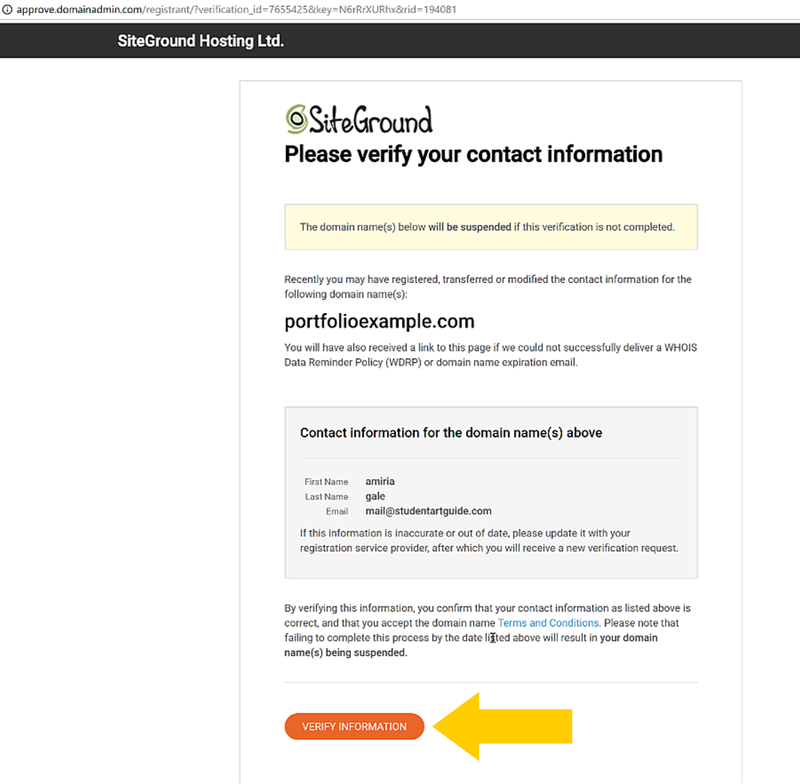 Due to recent changes to EU privacy laws, there is now an additional email from SiteGround, which asks you to confirm your data privacy settings. Follow the instructions in this email. I leave this unticked and click save, but this is up to you. As a reminder: SiteGround is the place you store your website files; WordPress is what you use to build the website. 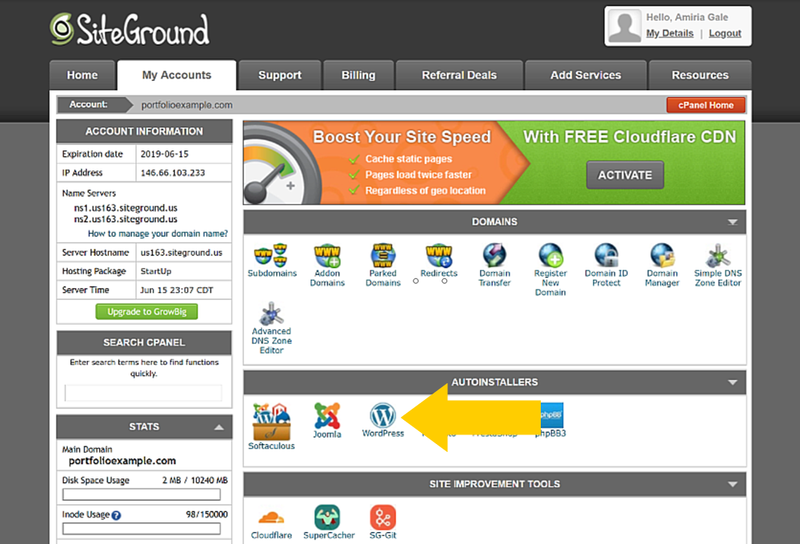 This section of the tutorial shows how to install WordPress at SiteGround. 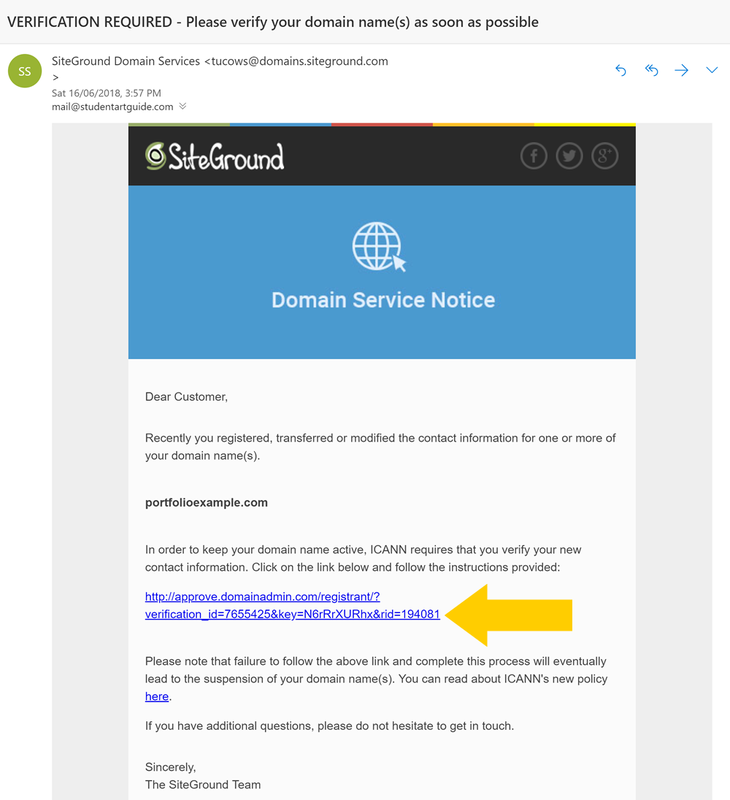 h) Return to SiteGround, refresh the screen and check domain status. It says ‘Active’, once verified. It may take a few minutes for this to occur. (You may need to sign into SiteGround again, and then navigate to ‘My Accounts’ on the menu, to return to the screen shown above). j) Select ‘Don’t need help now’. This is because SiteGround’s start-up wizard does not follow the same process used in this tutorial, so selecting the ‘start new website’ option makes following this tutorial more difficult to complete the SiteGround WordPress install. l) Tick the terms and conditions and click ‘Complete Setup’. m) Click ‘Go to cPanel’. cPanel is short for ‘control panel’. This is where you manage your hosting account. o) Click the WordPress Icon. The WordPress icon may appear in more than one place. It doesn’t matter which WordPress icon you click. p) Click ‘Install Now’, at the bottom of this page. 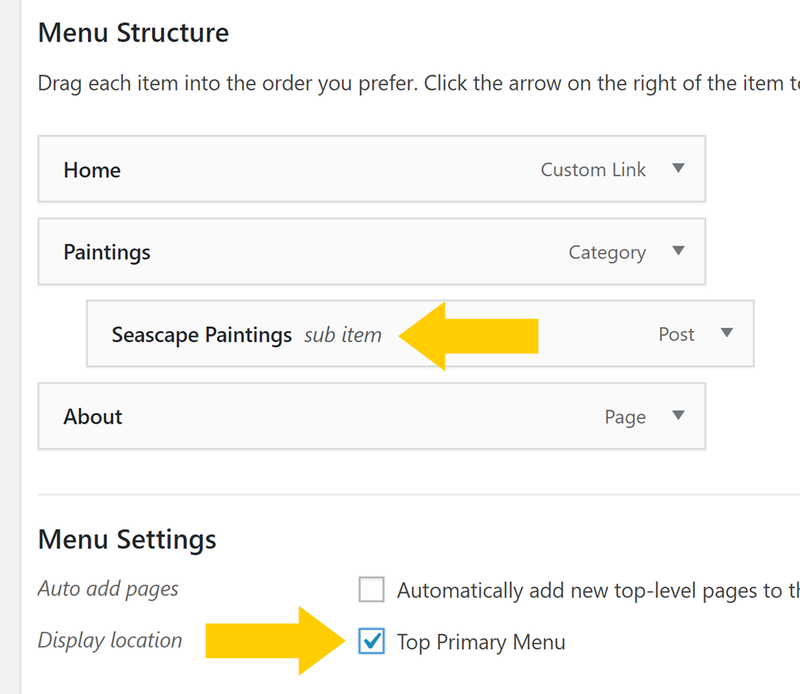 Now choose the settings you would like for your WordPress website. q) Decide whether you would like the ‘www’ to appear in your website address (in the ‘Choose Protocol’ section). www is more common; however, some people think it looks cleaner and simpler without. Neither option has any advantages or disadvantages, and you can change this later if you change your mind. The third and fourth options (with https at the start) are for those who have pre-purchased a security certificate called an SSL certificate. 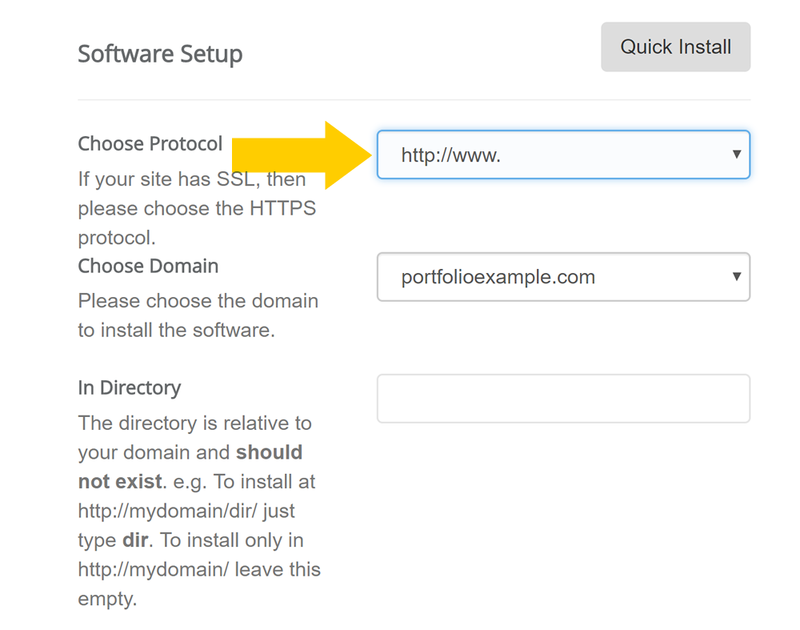 SiteGround offers free SSL certificates, so I’ll show you how to add this later in this tutorial. For now, select between the first or second option. r) Leave the ‘In Directory’ box empty. s) Create a site name and site description. This appears at the top of your website. You can edit this later, so don’t worry about coming up with the perfect phrase. t) Create login details for WordPress. Change the default options to something that you’ll remember and write these down, so you don’t forget. u) IMPORTANT: Change the email address to your actual email address (one that you currently use and have access to, such as Hotmail or Gmail). v) Scroll to the bottom and click ‘Install’. Leave all other options as they are. 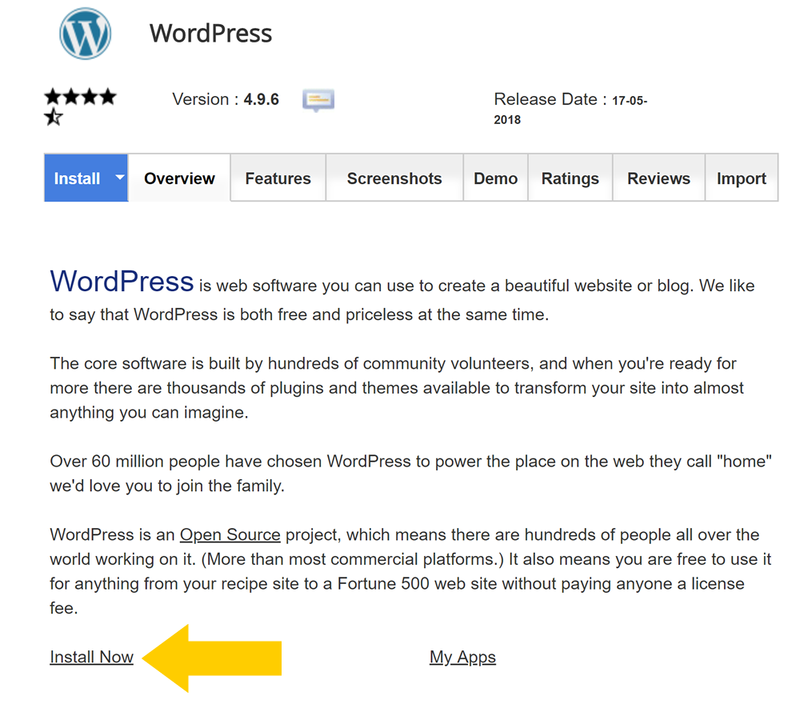 It takes only a minute or two for your SiteGround WordPress installation to complete. The next page contains two links. 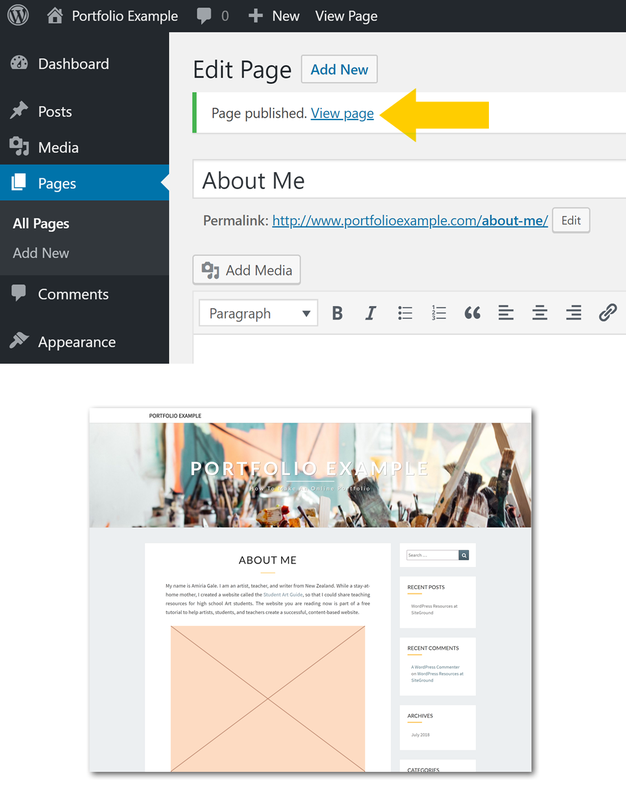 One links to your new website; the other to your WordPress dashboard: the place to edit and add content to your new site. a) Open the second link on this page and bookmark this (this is usually in the format www.websitename.com/wp-admin/). A lot of people forget how to get back to their dashboard, so bookmarking this page is a good idea. 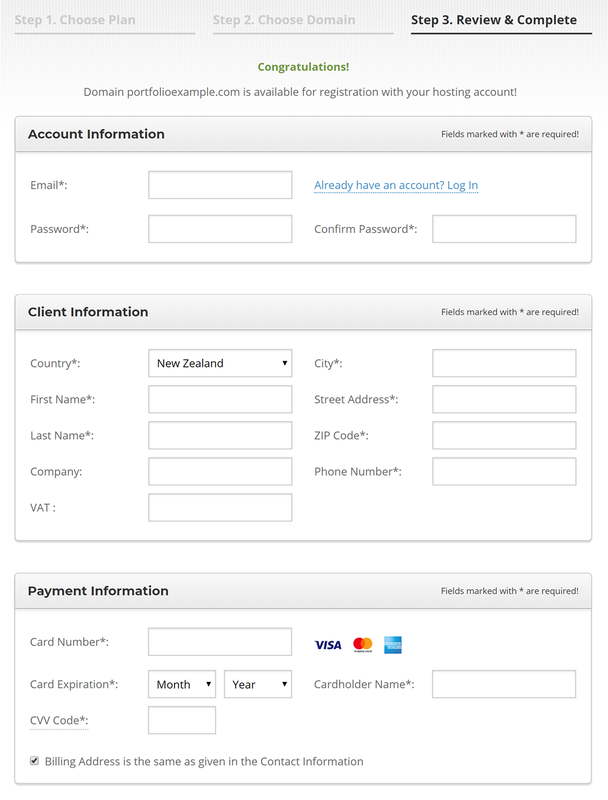 b) Sign into WordPress (using the login details you just created). c) Click ‘Visit Site’ in the top left corner (or click on the name of your website). You’ll see you now have a brand-new website, live on the internet! Of course, it looks very bland and empty, because you haven’t customized it or added any content. Nonetheless, it is a perfectly functional website, which you could use, out-of-the-box, just as it is. d) Return to your WordPress dashboard. The easiest way to do this is to click the website name found in the top left-hand corner of the screen. The black bar running across the top of the screen is only visible when logged into WordPress. This allows you to easily switch back and forth between your website and the WordPress dashboard. That is the hardest part done. It is time for the fun to begin! A new theme transforms the appearance of your WordPress website, without affecting the content. In other words, the layout, colors, fonts and styling change, but the writing and content stays the same. 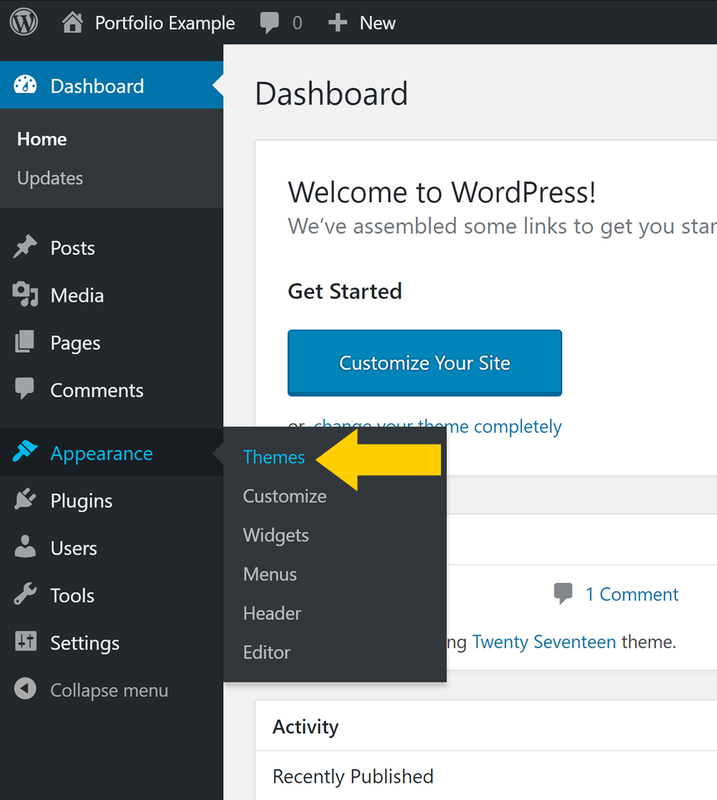 By default, WordPress comes with a few themes pre-installed. There are thousands of other free themes. a) In the WordPress dashboard, go ‘Appearance’ > ‘Themes’. b) Click ‘Add New’. This takes you to the WordPress theme directory – a collection of thousands of free themes, approved for use with WordPress (be very careful sourcing WordPress themes elsewhere). c) Search through the themes. It is easy to get overwhelmed and spend forever doing this. 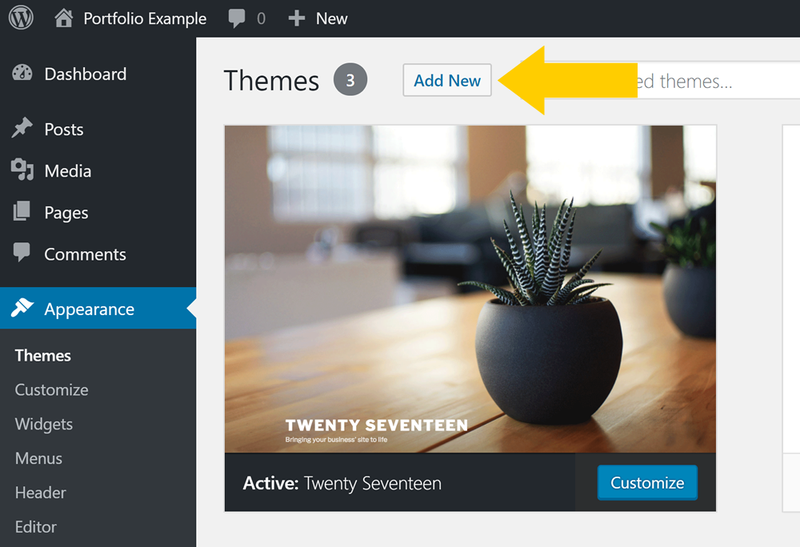 You can switch themes at any time, so don’t worry too much about finding a perfect theme right away. Aim for a simple theme to start with, such as ‘Nisarg’, which I will use for the rest of this tutorial. NOTE: When previewing themes, the preview function may not look like the thumbnail. Often you need to install the theme and customize it before it looks the same. d) When you find a theme you like, click ‘Install’ and then ‘Activate’. e) Visit and refresh your website. You will see it now looks totally different! Note: There are ways to customize your website far beyond the options described below, however, let’s keep things simple for now. a) Click the customize button. 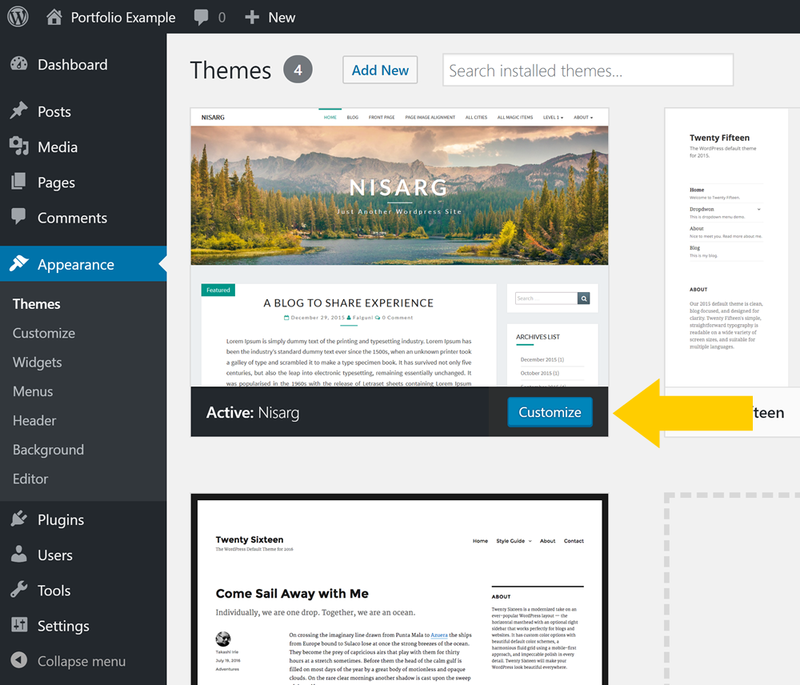 This can be accessed in three places: under the theme, as shown above; in the dashboard menu, under ‘Appearance’; and in the top black bar, when viewing your website). ‘Site Identity’ – allows you to change the title and tagline of the website, as well as upload a logo or image for a browser icon. ‘Colors’ and ‘Accent Colors’ – allows you to change the color scheme. ‘Header Image’ – allows you to change the large image across the top. ‘Background Image’ – allows you to add a background image. ‘Additional CSS’ – allows you to add code to change the appearance of the website further. This is not for beginners – leave this for now. ‘Post Options’ – allows you to choose whether you would like the whole article or just a summary of your latest articles to appear on the homepage. ‘Summary’ is usually recommended. c) Check how your website appears on different screen sizes. The buttons on the bottom left of the customize screen show you how your website will appear on a tablet or mobile. d) Click ‘Publish’ (top) to save changes. Let’s start by making an ‘About’ page. 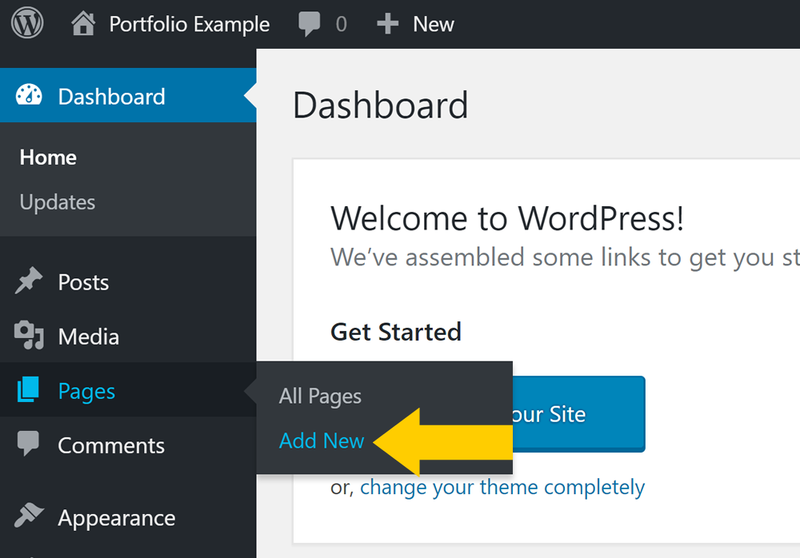 a) Go ‘Pages’ > ‘Add New’ (in the WordPress dashboard). b) Add a title, such as ‘About Me’, or something similar. d) Click ‘Add Media’ to add an image. e) Click ‘Upload Files’ and upload an image from your computer. Image file name: Before uploading, change the image file name to something descriptive, using hyphens between words. This helps Google understand your image. For example, call your image shell-painting.jpg rather than xzy123.jpg. You do this before you upload the image to WordPress. Title Tag: This is used by WordPress to organize your image files behind the scenes and sometimes appears if you hover over an image. This usually copies the file name and can be left as-is. Caption: This is the text that appears under an image on your website page. 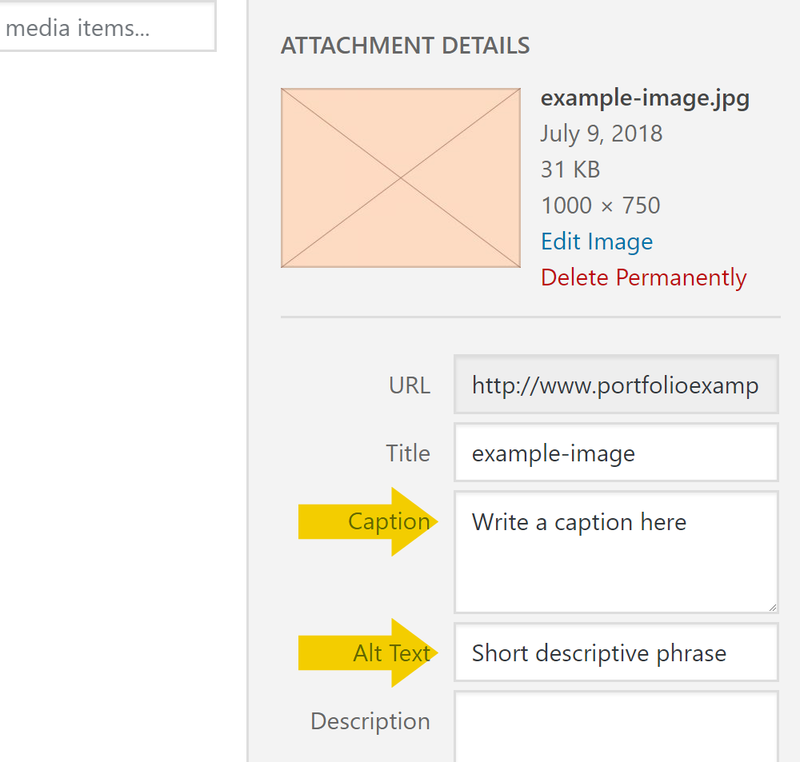 A descriptive caption helps Google understand the image and can be helpful for your website visitors. Alt Text: This is a short, descriptive phrase summarizing the image (such as ‘paintbrushes in jars’). The Alt Text is used by Google to help interpret your image. Description: Some WordPress themes show a longer image description (most do not). This can be another way to provide more information to Google about your image. I usually leave this blank. g) Select the display settings you would like. Alignment: Align your image to the left, right or center. I usually leave this as ‘None’, which means that the image fills the full width of the page. Link to: You can choose to link your image to another page or website. I usually leave this as ‘None’. Size: I usually leave this as ‘Full Size’ (If your image is extra-large, WordPress resizes this to fit the width of the page). h) Click ‘Insert into Page’. i) Click ‘Publish’ to make your About page live (don’t worry if this isn’t perfect at this stage – you can easily edit this later). h) Click the ‘View Page’ link to see your new About page. Posts can be categorized. For example, if you create an artist website, you might have a collection of posts about paintings; another collection about drawings and so on. You can then have the ‘Paintings’ category on your menu; clicking this would take you to all of the posts in this category (menus are covered later in the tutorial). Posts appear in lists. For example, by default, your latest posts appear in a list on your home page. There are also lists of posts for each category. Posts are suitable for most content on your website, as they are very easy to organize. Pages, on the other hand, cannot be categorized and do not appear in lists. Pages are useful for standalone content, such as an About page, or a Contact page. Don’t worry too much if this all sounds confusing; it will become clearer as you use WordPress. 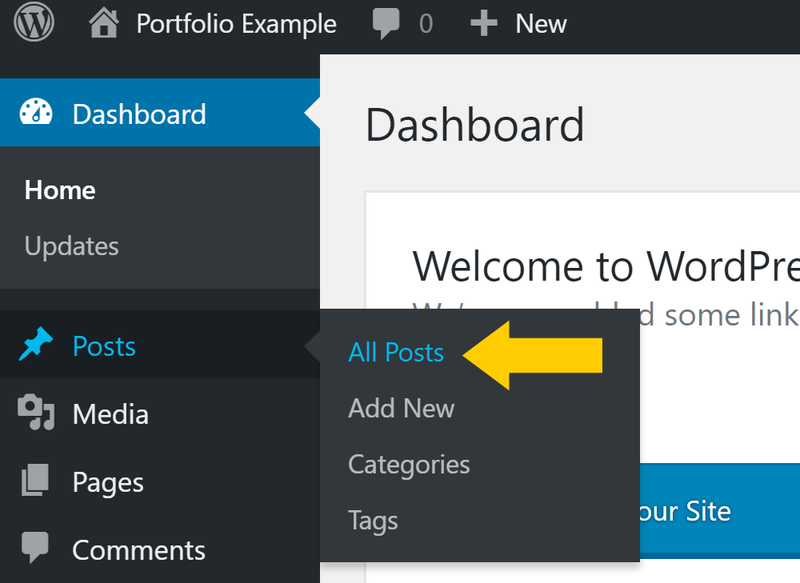 a) Go ‘Posts’ > ‘All Posts’ (in the WordPress dashboard). By default, WordPress comes with a sample post already created. We need to delete this. b) Click ‘Trash’ to delete the sample post. You need to move your mouse near the title for the delete option to appear. d) Add a title, images, and text. I have created a post called ‘Seascape Paintings’. You would, of course, create a post that is related to the content of your website. Add some text and images to this post, as you did previously. e) Select a category for the post (right of the screen, partway down). As this is our first post, we need to create a category. Create a name for the category. I have used ‘Paintings’ as an example. Select a Parent Category (optional). You can have categories that are sub-categories of others. For example, you might have a main category of Paintings, and then sub-categories called ‘Acrylic Paintings’, ‘Oil Paintings’ and so on. 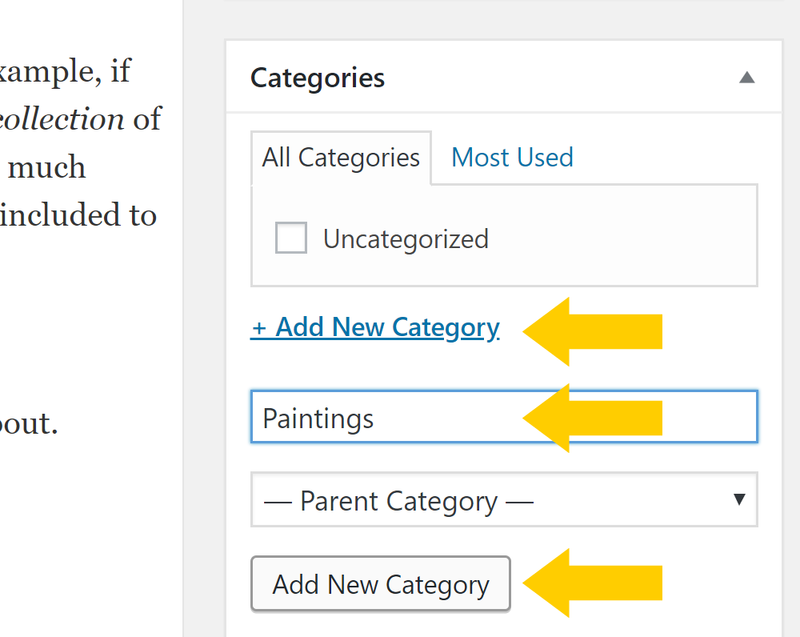 When adding ‘Acrylic Paintings’, you would make ‘Paintings’ the Parent Category. Click ‘Add New Category’ (the lower button). f) Set a featured image (optional), from the bottom right corner of the screen. The featured image may display as a large image at the top of the post or as a thumbnail image when shown in a list (see example below). Different themes show featured images in different ways. A WordPress thumbnail image example. g) Click ‘Publish’ (top right). h) Click ‘View post’ to see the new blog post on your website. 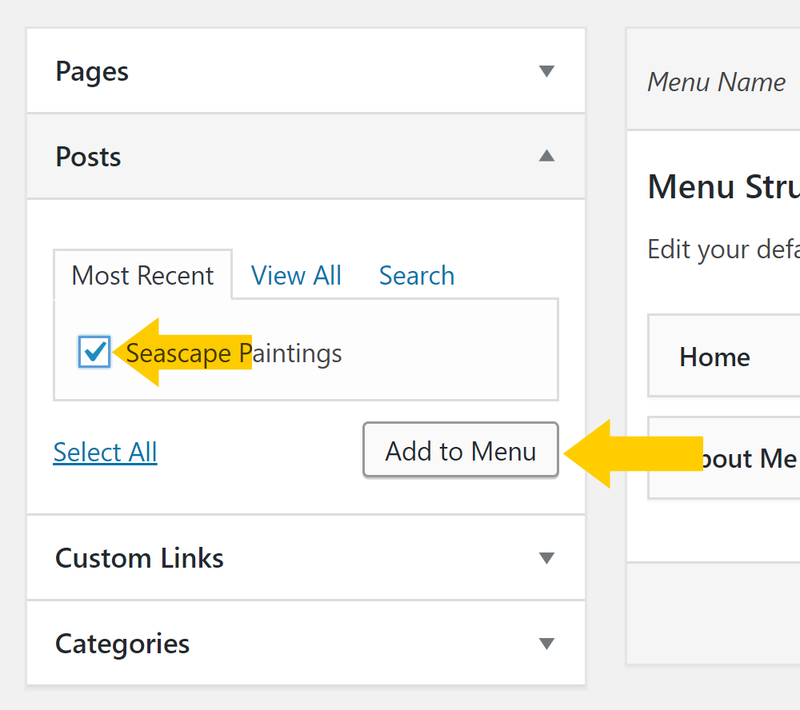 Menus allow people to navigate from one page to another on your website. Let’s begin by creating a menu at the top of the page. a) Go ‘Appearance’ > ‘Menus’ (in the WordPress dashboard). c) Add items to the menu. Tick items on the left and click the ‘Add to Menu’ button. For example, you can add pages, posts, and categories that you have created. d) Reorder the menu items as appropriate. I have indented the ‘Seascape Paintings’ post under the ‘Paintings’ Category. This means it will appear as a drop-down item on the menu, under Paintings. e) Rename the menu items as appropriate. Clicking on the menu item allows you to rename it to a shorter, abbreviated title. f) Select the display location. 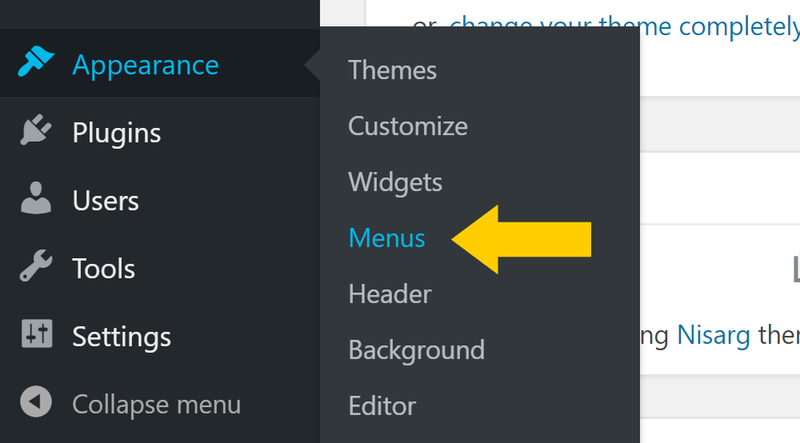 Some themes allow you to display the menu in more than one place (for example, in the footer or sidebar). Select ‘Top Primary Menu’. g) Click ‘Save Menu’. If you visit and refresh your website, you will see you now have a menu across the top of the screen. 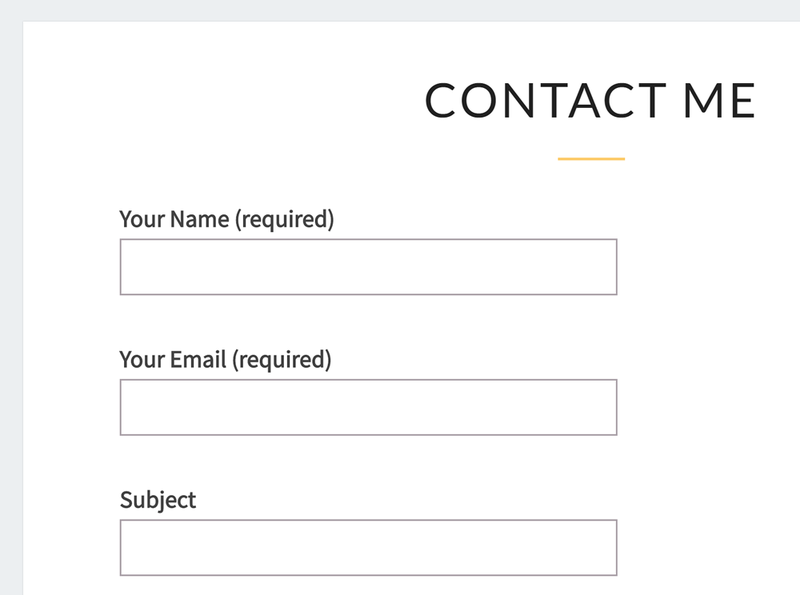 To create a contact form, we need a ‘plugin’. Plugins are like ‘apps’ for phones: they add extra functionality to your website. There are more than 50,000 free plugins available, which add contact forms, social media buttons, buy now buttons and so on. The more plugins you add, the more complicated your website becomes, making it slower to run. I recommend having no more than 20 plugins per site. a) Go ‘Plugins’ > ‘Installed Plugins’ (in the WordPress dashboard). b) Delete the existing plugins (these are installed by default). c) Click ‘Add New’. This takes you to the free WordPress plugin directory. d) Search for ‘contact form 7’. This is the name of a reliable contact form plugin. e) Note the plugin rating. Before installing a plugin, you should check its rating. Contact Form 7 has a 4 ½ star rating, has been installed over one million times, was recently updated and is compatible with the current version of WordPress. This is an excellent rating and tells us that this is a popular, high-quality plugin. f) Click ‘Install Now’ and then ‘Activate’. We now see the list of installed plugins in the WordPress dashboard. h) Click ‘Contact form 1’ (this is the default contact form). i) Click ‘Mail’ (this screen looks very complicated, but don’t worry)! j) Check that the ‘To’ email is the one that you want messages to send to. Leave all other settings the same. k) Highlight and copy the ‘shortcode’ (in blue at the top of the screen). Highlight the code (including the square brackets) and press CTRL C to copy this. l) Create a new page called ‘Contact Me’ (or something similar). 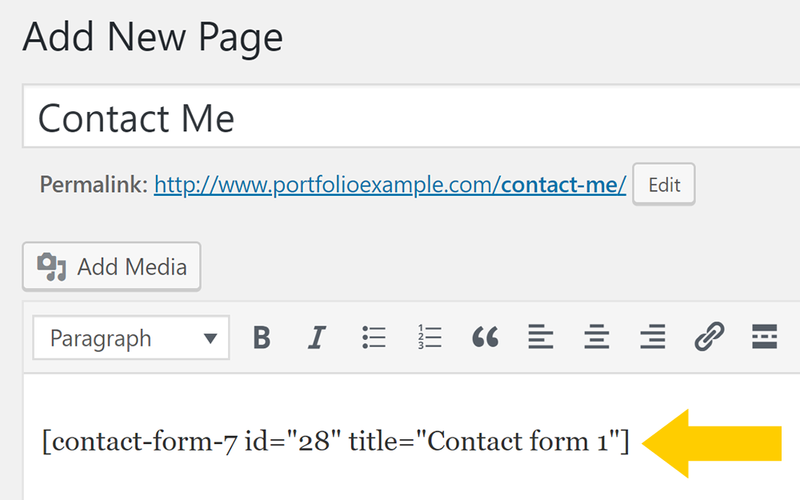 How to add a new page in WordPress is explained earlier in this tutorial. m) Paste the shortcode into the main area of the page (using CTRL V). You can write a message above or below this shortcode, such as ‘Feel free to contact me’. You may also wish to add a business address (do not disclose personal contact details online). n) Click ‘Publish’ and the view the page. 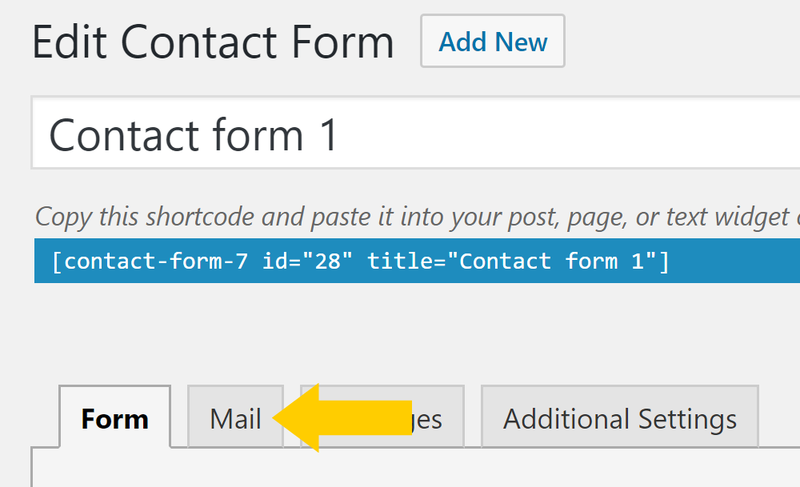 You will see that the shortcode converts into a contact form. Test this, and make sure that the message arrives in your inbox. o) Edit your menu and add your new contact page (so that visitors can easily find your contact page). Editing a menu is explained earlier in this tutorial. A widget is a small item that appears in the sidebar or footer of your WordPress website. a) Go ‘Appearance’ > ‘Widgets’ (in the WordPress dashboard). On the left-hand side of the screen is a list of all the widgets that are available. On the right-hand side of the screen is are the areas where widgets can be placed. The theme I am using allows widgets to be put in the Sidebar. By default, the sidebar comes with several widgets placed in it: a search box, a list of recent posts and so on. b) Check your website to see the widgets currently in the sidebar. c) Delete any widgets that you don’t want to appear. 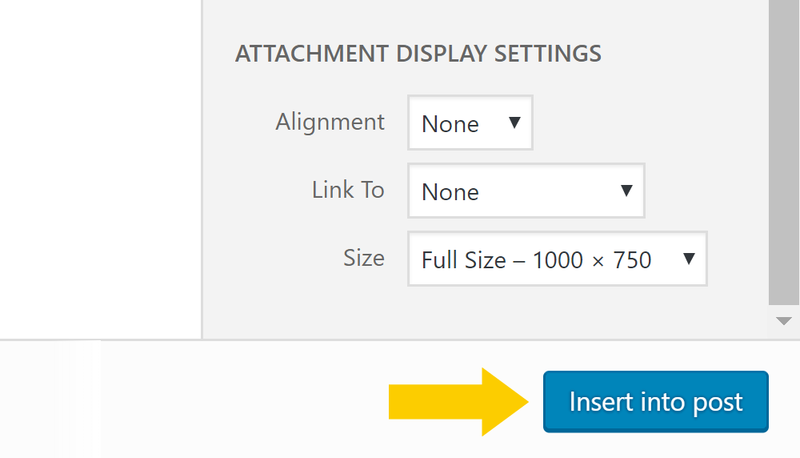 In your dashboard (under ‘Appearance’ > ‘Widgets’) drag any widgets out of the sidebar area. Alternatively, click the down arrow beside them (as shown above) and click ‘delete’. a) Drag a ‘text’ widget onto the sidebar area. To locate widgets, go ‘Appearance’ > ‘Widgets’. Scroll down to locate the ‘Text / Arbitrary Text’ widget (near the bottom). Drag this onto the ‘Sidebar’ area shown at the right of the screen. b) Add text and images. This will display in the sidebar on every page of your website and is a good place to introduce yourself or provide a welcome blurb. To add photographs, click the ‘Add Media’ button, as you would normally. There are many great plugins for this. I use one by Social Warfare. a) Go ‘Plugins’ > ‘Add New’ (in the WordPress dashboard). b) Search for ‘Social Warfare’. The full name of the plugin is ‘WordPress Social Sharing Plugin – Social Warfare’. This should appear first on the list when you search. c) Click ‘Install Now’ and then ‘Activate’. This takes you through to the list of your installed plugins. d) Click ‘Settings’ (under Social Warfare). e) Under the ‘Display’ tab, select which social platforms you want (drag the icons from ‘Inactive’ to ‘Active’). Scroll down and select whether you want the number of shares to show, and where the buttons should appear. There are other settings for floating buttons etc. under the ‘Styles’ tab. f) Click ‘Save’. 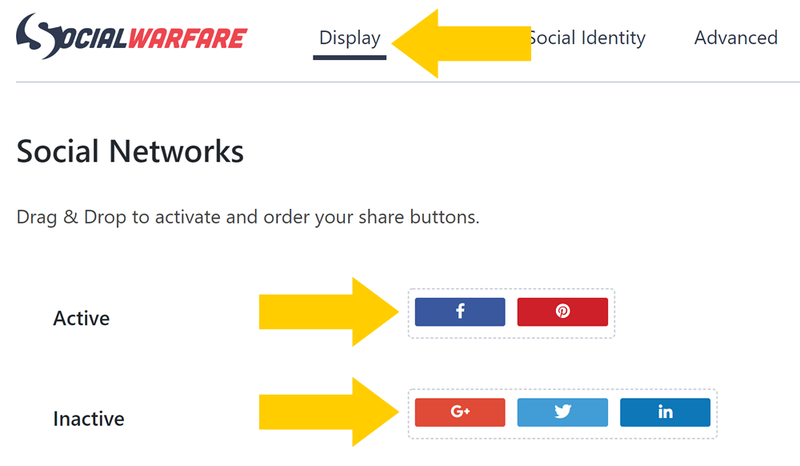 Visit your website and refresh the screen to confirm that the share buttons are now live on your website. b) Search for ‘PayPal Buy Now Button’. e) Enter your PayPal ID or PayPal email address (you need to have an account with PayPal for this to work). Paypal is used all over the world, taking care of processing credit card payments. f) Click ‘Save Settings’ (at the bottom of page). g) Edit a post or page where you want a buy now button. You will see that next to the ‘Add Media’ button there is now a PayPal button option. h) Click the position on the page where you want the button to appear (so that the mouse/cursor is in the right position). j) Enter the item name and the price and click ‘Insert’. The price must be entered exactly in the format given, so dollars followed by cents. Click ‘Update’ to save the changes to the post or page. When you load your new website in Chrome browser, it warns you that your website isn’t secure (Chrome browser is an alternative to Internet Explorer, Firefox or Safari). This warning appears on any website that doesn’t have an ‘SSL certificate’ installed. Adding an SSL certificate changes your website address from http to https and is recommended by Google. Although this sounds complicated, it takes only a few seconds. A SiteGround SSL certificate is free. b) Search for ‘SG Optimizer’. This the SiteGround cache plugin, which has been created to make this process simple. d) Go ‘SG Optimizer’ > ‘HTTPS Config’ (in the WordPress dashboard). e) Tick the pale grey box. Sometimes there is a warning message saying not to do this (this might occur if you have added a plugin which conflicts with this, for example). If a warning appears, do NOT push the button, and seek assistance from SiteGround live chat. For almost all new sites, there is no problem at all with pushing this button, however. f) Sign in to WordPress again. g) Check that your browser now says your site is secure! It should now say https at the start of the URL. This means the site is extra-secure and Google is happy. 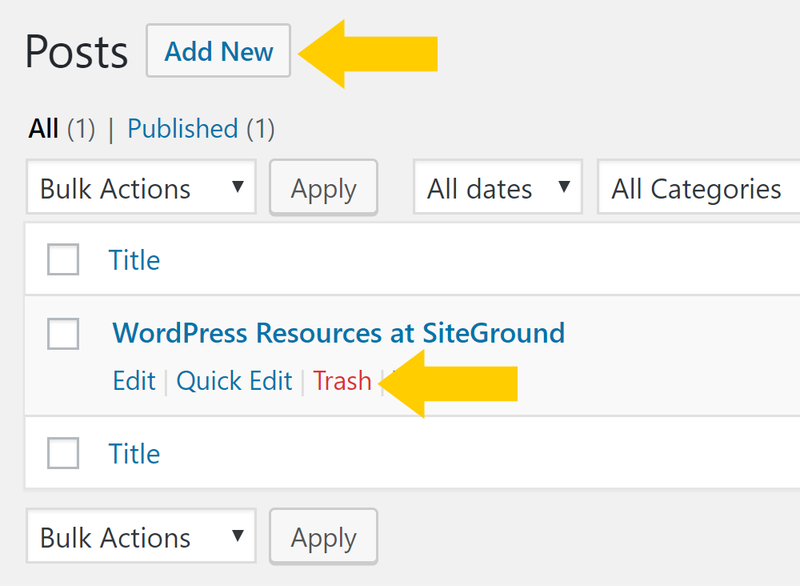 This section of the tutorial shows how to complete a SiteGround WordPress backup, which you should do before you make any major changes in the future, such as adding or updating plugins or publishing new content. Your website can become a major asset, so remembering to keep a backup copy is important. 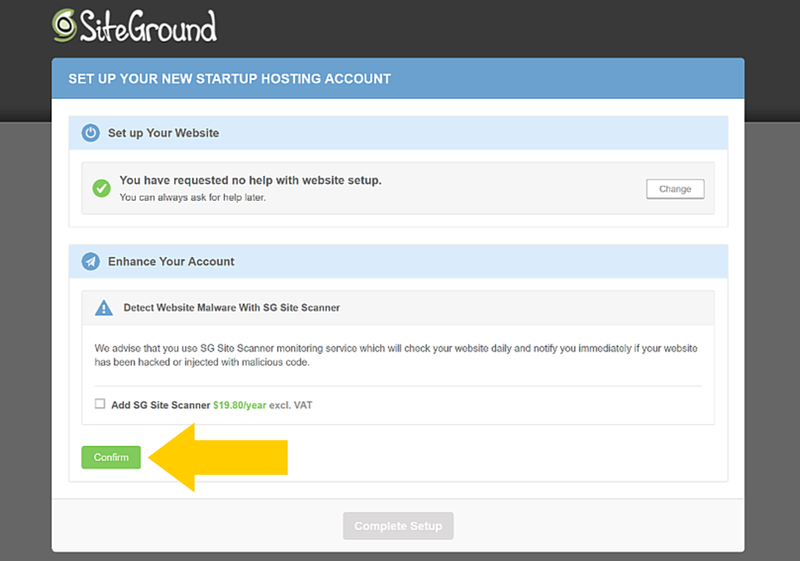 The steps below show a full SiteGround backup of your entire hosting account. 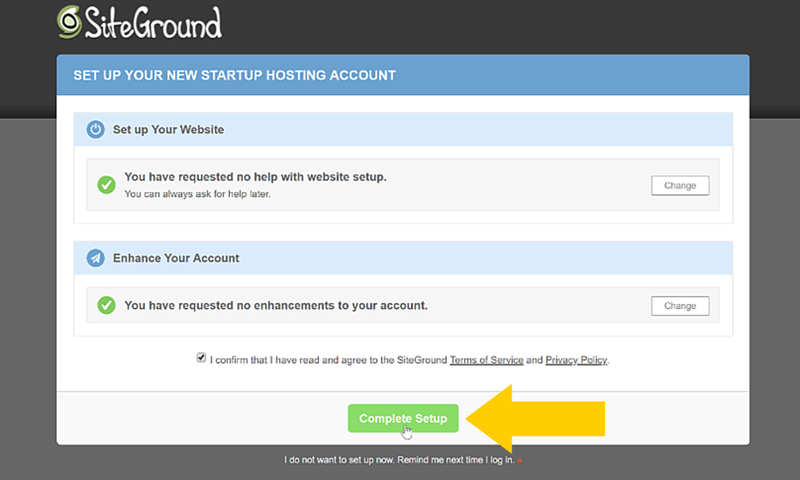 1) Sign in to your SiteGround account. 2) Navigate to ‘My Accounts’ on the menu. 3) Click ‘Go to cPanel’. 4) Click ‘cPanel Backup’ (lower down the page). 5) Click ‘Download a Full Website Backup’. 7) Click ‘Go Back’ to return to the previous screen. 8) Click the new backup link to download. This link only appears once the backup is complete. 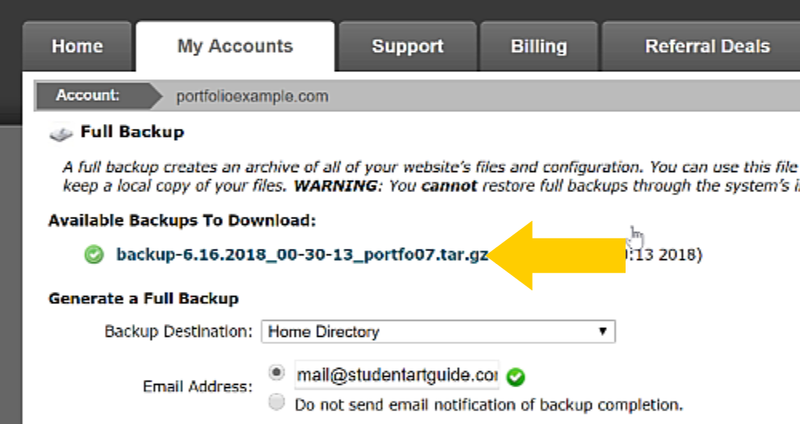 Clicking the link downloads the cPanel backup to your desktop. This tutorial is quick and broad so that you get your website up and running. For those who would like more assistance, I am in the process of creating additional tutorials to guide people through the process of customizing the appearance of their WordPress website, as well as how to measure and grow traffic to your website. If you have found setting up WordPress confusing, please don’t fret. You have done the hardest part; everything becomes infinitely easier from here on out. As with anything new, it takes a few days to become familiar with where the shortcuts and buttons are in the WordPress dashboard. The key is to get started and add content to your site: WordPress is learned fastest by doing. Once WordPress becomes second nature to you, the rewards are enormous: it opens the doorway to the world. If there is anything in this video that you need help with, please don’t hesitate to send me an email. I update this tutorial regularly, and feedback is highly valuable and appreciated.